Just got exclusive presale access to see Depeche Mode! 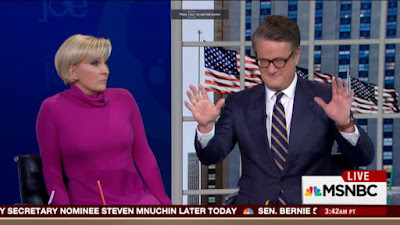 Conservative Talkshow host & former Republican Congressman Joe Scarborough is alarmed and calling for immediate denouncement by all Republicans in Congress and the White House of stunning comments by WH advisor, Stephen Miller. Watch this clip, it's jaw-dropping. Scarborough points out that Miller has no law degree or law education and seems not to understand the Federalist Papers, The Constitution or how separation of powers works. Miller's comments are a combative challenge to the Judiciary, to the US Republic, to the US Constitution and to the essence of our country’s balance of power. This is "doing violence to the US Constitution,” Scarborough noted. The pillars of our country and the sacrifices made to create this nation are being sh*t on. Republicans especially should be concerned that this is being done under their banner. Call your Senators & Reps and ask them to speak up. 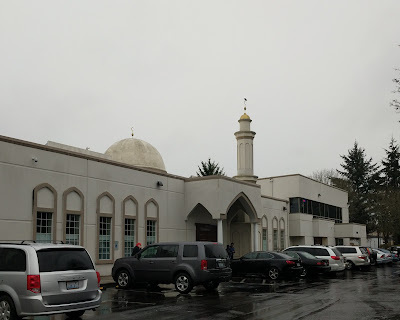 In late January, after the Seattle Womxn's March, I was listening to KUOW and I heard Aneelah Afzali of the Muslim Association of Puget Sound (MAPS) in Redmond speak about how the march was a good first step but if non-Muslims are serious about combatting Islamophobia and the division that goes with it, they have to do more. 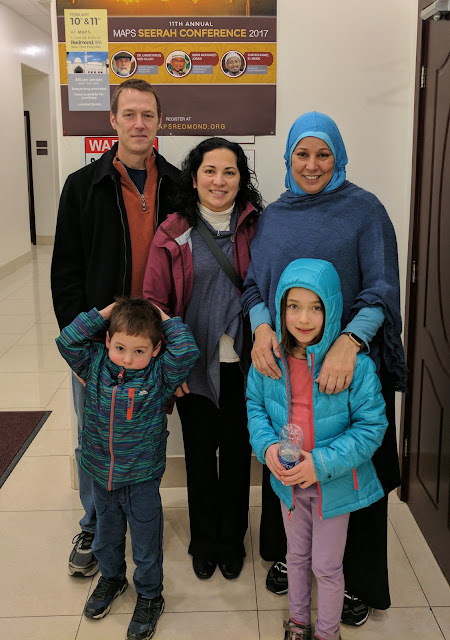 Reaching out and getting to know our Muslim neighbors plus dispelling some of the false assumptions and "otherness" of American Muslims was the second step. She mentioned that MAPS would be doing Open Houses for the public to come and see a Mosque and learn basic information about Islam. Ken and I thought this was important to expand our knowledge about Islam and Muslim people and to make personal connections since we didn't personally know any Muslims as it was. I reached out to MAPS on the day the Executive Order banning refugees, green card & visa holders from 7 predominantly Muslim countries was released and expressed our empathy and support for their community--I also inquired if we could attend their next open house. To my surprise, they were kind enough to just invite us over within the next weekend. Which leads me to today and our enlightening visit to MAPS in Redmond. Our guide Chema met us in the entry, clad in a turquoise blue headscarf and holding a tall cup of Peet's coffee. She instantly made us feel welcome and even tried to make small talk with the kids. As she took us through the mosque (they call it a masjid which is the Arabic word for 'mosque'), we were offered food and people came up to us to say hello. I was struck by how warmly the women greeted each other and even women who didn't know Chema said goodbye to her as if she were a longtime friend. A wedding celebration had just cleared out and one of the men gave the children cookies from the festivities. Men and women setting up chairs wasted no time changing over the great hall for a benefit later that evening to raise funds for the Bellevue Mosque that had burned to the ground (by a mentally ill homeless man) last month. Chema described the tenents of Islam and explained how it is a peaceful and humble religion. The humbleness and helpfulness were aspects I haven't heard much about. From what I gathered, a Muslim is taught to always help his/her neighbors (no matter who they are) and to be humble in dress and manner. Some of the ways that is visible is in the head coverings for women and the separation of the sexes on each side of the room. I asked about why some of the women I saw wore headscarves while others had veils over their nose and mouths. With 1.5 Billion Muslims on the planet coming from areas as diverse as North Africa, SE Asia and the Middle East, their regions and environments play a part. Chema pointed out that a woman I saw with a veil is from the Middle East, where the topography and sandstorms necessitated nose and mouth protection, and was incorporated into the traditional garb. But Chema herself only wore a headscarf as she was from Tunisia in North Africa. She explained how they pray facing Mecca 5-6 times a day and showed us a library where they keep a vast number of texts of the Quran itself plus multiple volume interpretations by various scholars. There are a lot of books a student and follower of Islam has to read and it's mostly in Arabic. They also consider the ancient scrolls, Torah and Bible holy texts as they are part of the Abrahamic religions. They consider Moses, Jesus and Mary to be honored disciples of their God, Allah. Whenever Chema mentioned Allah's name or any of the disciples, she would add "peace be upon him/her." All this is to say that Islam seems to make room for the other religions & their texts but I'm not so sure that's reciprocated by the others. We were fortunate enough to be there when people were called in for prayer. The man who manages the mosque sang out a traditional call to prayer that floated out over the entire building's sound system. Chema translated the words as he sang. The melody and the sound of his voice were both tranquil and reverent. It was very beautiful. We also got to observe from the back as the men, all heads pointed in the same direction, knelt on lush red carpet and did their prayers. The kids did very well considering they were required to stand with us as we were touring and listen for a lot of the time. But it didn't hurt that they got cookies. We saw a number of children running about with their parents. The center has many programs for kids as well as preschool and youth activity programs. It's hub of a community that also has a cafe, boutique, meeting rooms and offices. The people at MAPS are devoted to helping people outside the Muslim community. They regularly provide food, clothing and supplies for the homeless, Tent Cities & Refugees. 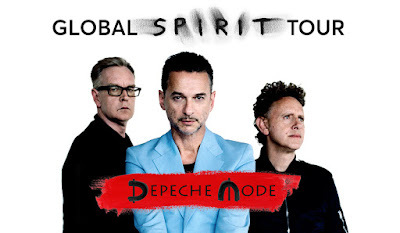 Looking on their website, it's easy to find the numerous events/drives they have. It's quite inspiring to hear how they do so much for their surrounding communities that may not be as welcoming or mutual. This was an eye-opening experience. Chema is a fantastic ambassador for MAPS with her relatable demeanor and her clear devotion to her faith and community. Even though we only spent a little more than an hour with her, it was clear the a basis of Islam (as imparted to us) is living a life in service to being a good person and helping those around you--which sounds like the tenets of some other belief systems. Unfortunately in Islam, as in Christianity and Judaism, there are a few bad eggs who do terrible things in the name of God. But in Islam's case, the actions of a relative few out of 1.5 Billion followers have stoked fear and intolerance enough to inspire our own government to retaliate with things like the Muslim ban. It's also horrifying to learn that because of that, a threat was called into the MAPS recently which requires them to take extra security precautions. Their sign has also been defaced twice in the last 4 months. Therefore, Humanizing Islam and Muslims is a crucial step in dissipating fear. I would encourage anyone to take an opportunity to attend an open house at a nearby mosque or initiate a dialog with a Muslim friend/colleague.